Looking to host a screening of H.O.P.E. What You Eat Matters or our Plant Power Stories? THANK YOU! Whether you’re planning to screen one of our films at a festival, community centre, cinema or café, or wish to use a film as part of a talk at a school, conference or another public space, we’re very happy for you to do so, and really appreciate your support in spreading our message. Our goal is to encourage people worldwide to discover the benefits of a healthy, sustainable and compassionate way of eating and living, which is why we offer all screenings FREE OF CHARGE – you won’t need to buy a license for your public viewing from us. Simply write us an email via our contact form. Choose the category „Host A FREE Screening”, let us know where and when you would like to host your screening and we will contact you. For your film screening you will receive a download link to the English film. We do NOT send DVDs and Blu-rays. Posters for your film screening to download and print can be found here. H.O.P.E. 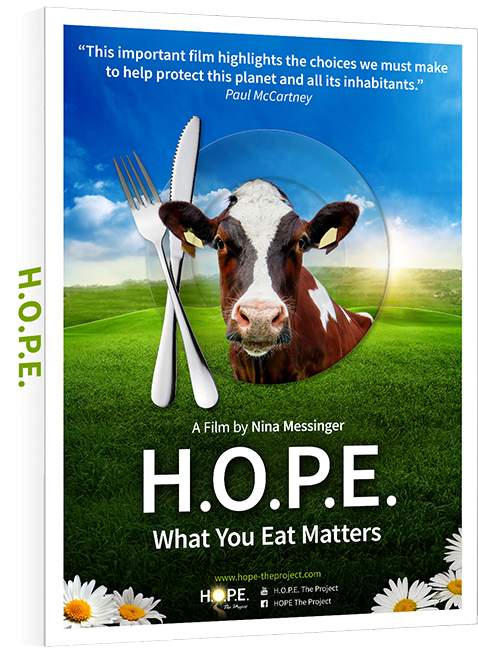 is a life-changing documentary uncovering and revealing the effects of our typical Western diet on our health, the environment and animals.